Extending across 6 million sq.ft. 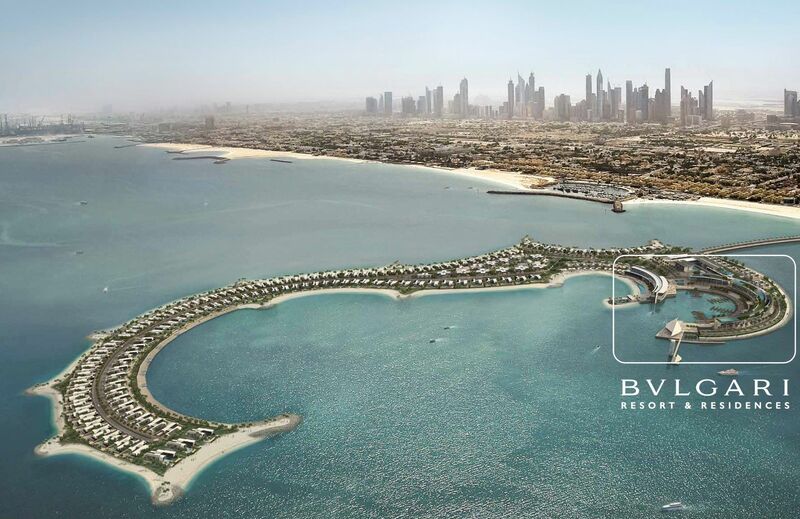 of land, Jumeira Bay Island is a manmade marvel located off the coast of Jumeirah. Enjoying an enviable and central location just off Jumeirah it boasts picturesque vistas of the glistening Arabian Gulf and Dubai’s mesmerizing iconic skyline. Jumeirah Bay is a mixed-use island development by the renowned developer Meraas is sculpted in the shape of a titanic seahorse riding the arcs of sand and rock. The level of security and privacy is exceptional. The gated island community can only be directly accessed via a 300-meter bridge exclusively provided for residents and visitors. The island is unquestionably set to become the new address of choice for exclusive luxury homeowners looking to enjoy exclusive luxury. Featuring only low-rise residential buildings and villas the man-made island is a private heaven for its residents. Bulgari Hotels & Resorts is the leading luxury hospitality collection in the world. Comprised of a few selected properties in major cosmopolitan cities and luxury resort destinations conveying the excitement of the Bulgari Brand, its timeless glamour and its heritage of the magnificent Italian Jeweler. Each Hotel & Resort property is located in the most prime luxury neighbourhood in the city and features unique physical characteristics that make it truly remarkable always with strong reference to the local culture. Bulgari Hotels & Resorts in Dubai is designed with an Italian contemporary luxury feel, enriched by rare and lavish materials featuring design furniture and custom-built details. The guest's experience is made flawless by an innovative luxury service concept informal yet impeccable. The Italian Bar and Restaurant ‘Niko Romito’ is celebrating Italian Food and complemented by Hoseki, a Japanese food experience is setting the Hotel up to become the city’s most coveted meeting point for the local high up society. Meraas Developments always adds an artistic addition to Dubai’s cityscape that is intrinsically classic yet futuristic with a theme of live-work-play. Strategic location, bespoke design and eclectic choice of partners are the hallmark of each development ensuring their high uptake and popularity among residents and tourists alike. Designed by Italian architectural firm Antonio Citterio Patricia Viel and Partners, Bulgari Resort and Residences Dubai is a first-of-its-kind master development in scale and magnitude. Bulgari Resort and Residences Dubai is the worlds fifth comprising of 100 rooms and suites in the main hotel buildings, 20 hotel villas, 173 Apartments with a few Penthouses, 15 Mansions a 127 Land Plots allowing for personalized design-and-build. Another gem that will sparkle on Jumeira Bay is the first-in-the-world Bulgari Marina and Yacht Club a place where taste, elegance and refinements meet and merge. Al la Carte Services: Housekeeping, In-Residence Catering, meeting & Conference Room and more. The Marina and Yacht Club Accomodating Yachts Up To 120 FT. The Bulgari Marina will comprise over 50 berths and will be able to accommodate boats from 30 to 120 feet. The berths will benefit from all the services of the Hotel including Housekeeping, Security, Concierge, Florist and onboard catering facilities. The Yacht Club is an exclusive members-only facility, with a large outdoor pool and seaside decks, set in a lush landscaped garden. It will also feature a Lounge Bar and Members Lounge. The pedestrian-only Promenade in front of the Residences connects the Bulgari Hotel building with the Yacht Club. Inspired by Italian seaside harbours like Portofino, it will host six independent world-famous restaurants, which will provide residents and guests with the finest culinary experiences.